Are We Ready for Kindergarten? 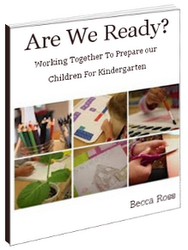 Home / Are We Ready for Kindergarten? Learn the things kindergarten teachers wish you knew before sending your kids to kindergarten. Are you starting to think about sending your child to kindergarten? Are you wondering if he or she is ready? In this e-book, I share the things I wish I knew about kindergarten before I sent my kids off to school. I taught first and second grade when I sent my own kids to kindergarten. I thought we were prepared, but there were so many things I didn’t realize. After making a move to teach kindergarten, I’m sharing all of the things I wish I had known. Hindsight is 20/20, right? Everyone wants their child to be confident and ready for kindergarten. Grab this e-book TODAY and help your child gain the skills they need for this important step in their education.